Earn $3.15 in Rewards credit (315 points) What's This? Not all adventures require hair-raising treks into the great unknown, sometimes just getting from your house to work on two wheels can constitute an adventure. With Vittoria's new Adventure Tech G+ Tire, you can ride easy knowing that you'll make it through unscathed thanks to the added puncture protection, grip, and fast-rolling efficiency. 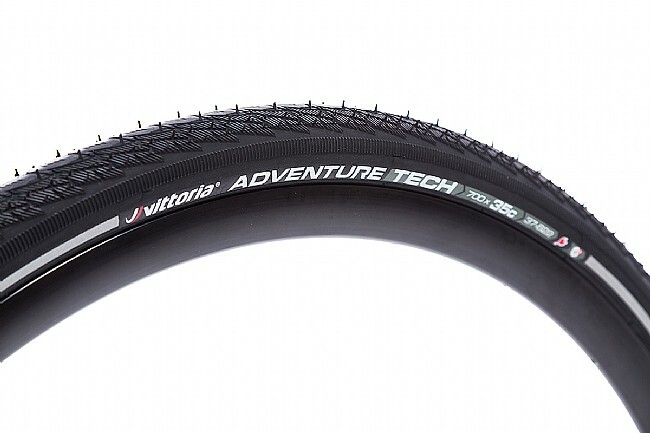 The Adventure Tech Tire uses Vittoria's Graphene G+ compound, designed for long-lasting durability with natural puncture resistance. The tire itself features a fast-rolling semi-slick central tread that transitions gracefully to mild side tread that digs in during cornering in all conditions. With their Solid Shielding technology lying just under the rolling tread, Vittoria ensures that punctures are virtually a thing of the past. The Vittoria Adventure Tech G+ 700c is available in three widths: 32, 35, and 38mm. 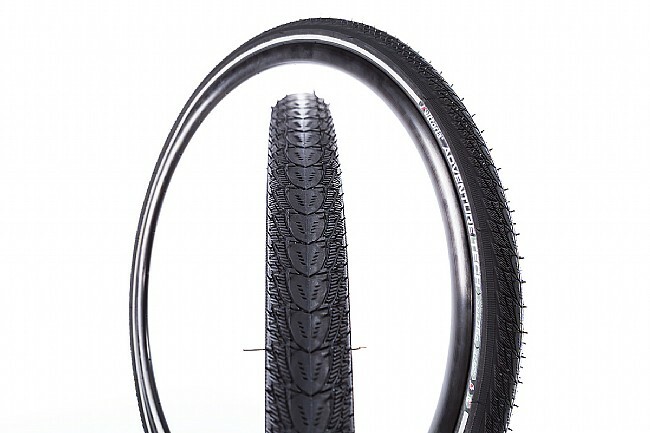 Also available in 26" MTB sizes. Graphene G+ Compound is fast-rolling, grippy, and durable. Regulation compliant for e-bike use. Fast-rolling center with gentle side tread. Solid Shield puncture-protection layer provides added security from flats. Reflective sidewall stripe for low-light visibility. Claimed weight: 740 grams (700x35mm).